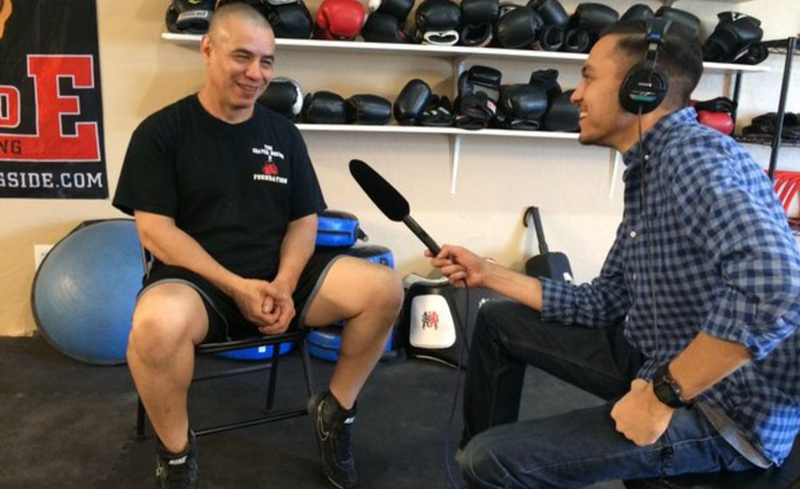 Next Generation Radio reporter Gus Contreras (right) interviews Pete "The Punisher" Chavez about his boxing career and youth-oriented nonprofit foundation in Phoenix, Ariz. 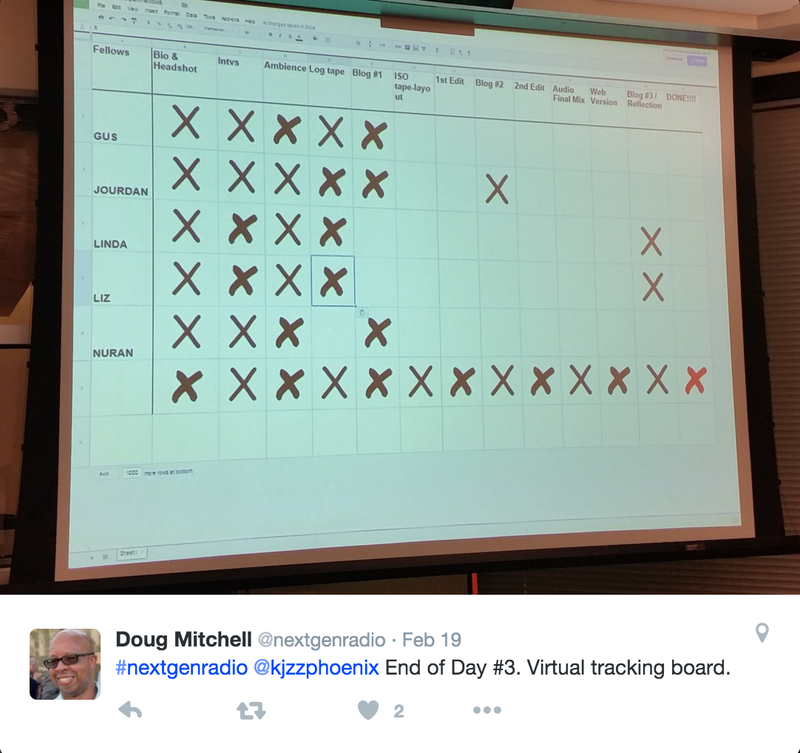 In February Contreras participated in the Next Gen project at member station KJZZ. Photo by Ambar Espinoza. #JournalismSoWhite, which vividly embodies the need for more diverse news coverage and news staffs, has gotten a lot of journalists reflecting on this: How can and should newsrooms strategically find, train, hire and retain talent that looks and sounds like America, circa 2016 (vs. 1976)? "Through these Next Generation Radio projects, we are finding young people of color, and especially women of color, who want to work in public media." Let’s pull back the curtain and explain how Next Generation Radio is successfully finding diverse, digital-first college students and early-career journalists through a competitive application process, then putting them in a mobile newsroom to audition in front of us — the talent scouts, producers and hiring managers of public radio. When Mitchell founded the program in 2000, Next Gen almost exclusively embedded at journalism conferences, like last year’s Minneapolis project at the College Broadcasters, Inc., convention. Today Mitchell has changed the focus to directly building connections at NPR member stations that sit on college campuses with journalism programs. This collaboration is key for project funding: the University of Nevada at Reno’s Reynolds School of Journalism sponsors that project, while most of the money for Next Gen at the University of Texas at Austin comes from member station KUT. And the Next Gen mentors, who are public-media journalists from around the U.S., are “donated” to the projects by their employers. 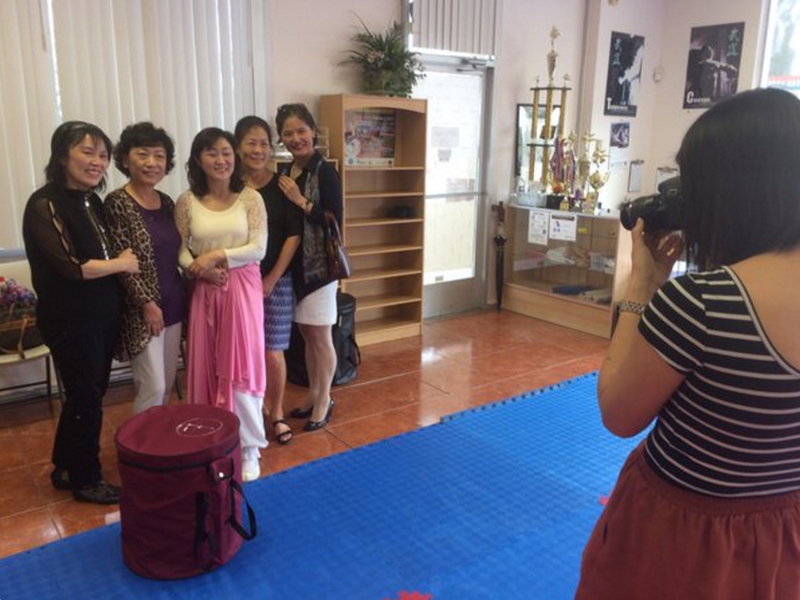 After a Korean percussion class, students pose for KJZZ Next Gen reporter Linda Chen (right). Photo by Jess Naudziunas. Next Gen has always been digital-first, but nobody really used that term in the early 2000s. It was difficult to get students’ work on the radio, so a website was built for each project, showcasing the radio stories. From the early days, the student reporters seemed to understand that publishing their journalism online, even as far back as 2000, would be essential to growing their careers. Next Gen followed the students’ lead and now includes social-media components. Students promote all their work via Facebook, Twitter and Instagram, from their finished radio pieces to photos of the people and places featured in the stories. The Next Gen website for each project includes story photos and such online extras as participants’ reflections on the project. X marks the deadline: When a student reporter crosses various tasks off the to-do list, that sometimes inspires friendly competition. Throughout the week, students and mentors promote the work that’s happening in the newsroom (and all the fun we’re having during and after work hours) on our social-media accounts — using GIFs as well as photos showing the diversity of previous project participants and professionals. It’s vital that if we want to bring people of color into public radio, then Next Gen’s marketing and promotion platforms should present us in all of our diverse glory. We mentors spend a lot of time talking to students and each other about the craft of radio and the tenets of journalism. Fundamentally, the Next Gen projects are all about mastering the basics of editorial (What’s your story? Who should care about it? What questions will you ask?) and production (audio, video, photo, online writing, formatting content for distribution). We push the students to become experts of the process, so they’ll have long careers. Inevitably, the same big-idea questions emerge during each project, all demonstrating the reality that putting substantive journalism on the radio is harder than it looks. Next Gen students must report non-narrated stories, in which interviewees tell their stories in their own words. Both students and mentors have a hard time with this, as they’re used to a more formal reporting style: I am the expert presenting this story, writing and voicing a script to propel the narrative. 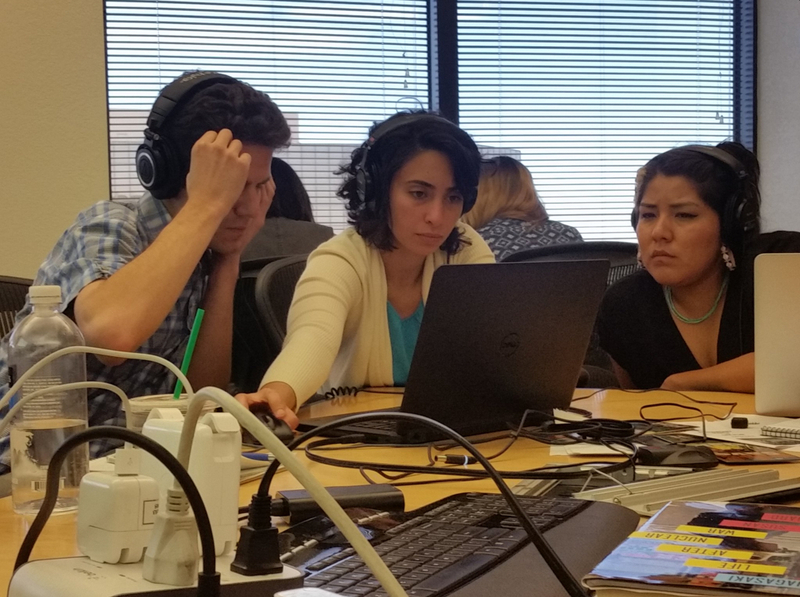 Technical advisor Drew Jostad (left) and mentor Odette Yousef (center) work with KJZZ Next Gen reporter Jourdan Bennett-Begaye to mix her radio story. Photo by Doug Mitchell. With the re-emergence and intimacy of podcasting, this non-narrated style, often grounded in a journalistic or news-minded sensibility, will keep growing (see: Snap Judgment, Radio Diaries, This American Life, et al.). It pushes radio-makers to be flexible in their audio-production skills, learning how to play with audio more creatively; to listen closely during an interview and make sure they’ve recorded all they need; and to go out into the world and talk to people rather than relying on technology (on their phones, at their desks) as the intermediary. The end of a Next Gen project doesn’t mean that the professional development stops. Just ask Ambar Espinoza, environmental reporter for Rhode Island Public Radio, All Things Considered co-host Audie Cornish, Shereen Marisol Meraji from NPR’s Code Switch, Mwende Hahesy, who recently started a new job as production manager for Reveal from the Center for Investigative Reporting … the brag list goes on. 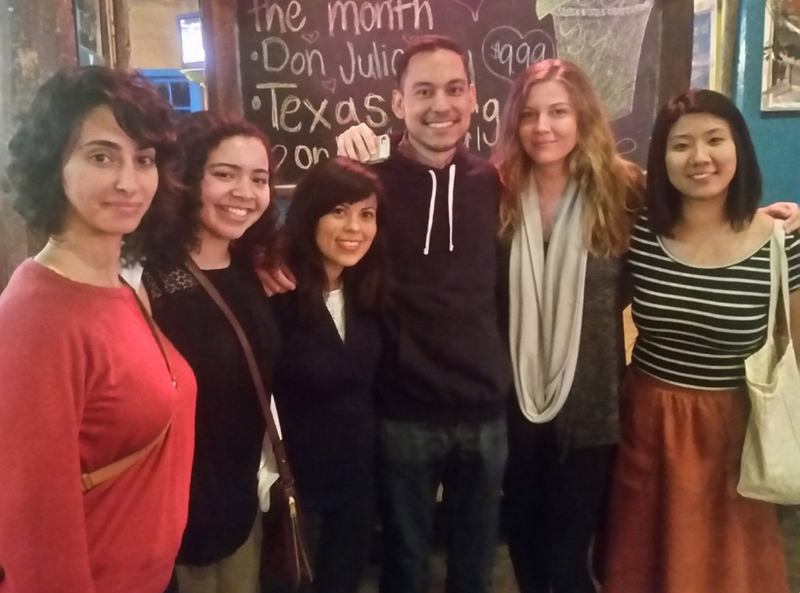 The KJZZ Next Gen project in February included six former NPR interns (left to right): mentor Odette Yousef, reporter Elizabeth Miller, mentor Ambar Espinoza, reporter Gus Contreras, mentor Jess Naudziunas and reporter Linda Chen. Nor does it mean that all the big, existential questions have been answered. Mentors and students form a family that remains connected long after the week’s bootcamp. As past participants go through job searches, grad school or fellowships, Next Gen alumni offer guidance on everything from strengthening journalism skills to developing organizational savvy (i.e., dealing with office politics), most frequently through social media, but often over drinks, too. Next Gen just wrapped up a project at the University of Southern California in March, and we have five more in 2016: back to Reno in May; in Atlanta at Georgia State University in June; at KUT in Austin in August; with Minnesota Public Radio in September; and in collaboration with Capital Public Radio and Sacramento State in October. There are others who have inquired, but we ran out of calendar space. Next Gen is doing its part in solving the diversity problem: Through these projects, we’re finding young people of color, and especially women of color, who want to work in public media. The first two projects of 2016 at KJZZ attracted a total of 156 applicants; of those, 72% were women and 61% were people of color. We’d bet money there are a ton of companies that would love to have that kind of applicant pool. For 14 years, Elaine Heinzman has worked as a radio and podcast producer, from NPR weekend newsmagazines to cultural programs at WNYC, including being part of the 2002 launch team for the daily music show Soundcheck. Since 2004 she has mentored and trained young journalists through Next Generation Radio. She’s @elenatherican on Twitter.